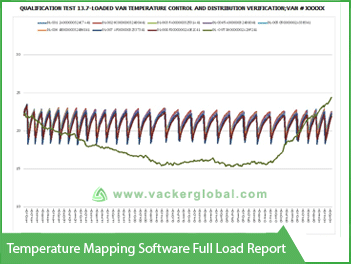 Vacker Saudi Arabia or KSA has managed to develop a specific software on its own, given the years of long exposure in the field of performing temperature and humidity mapping. 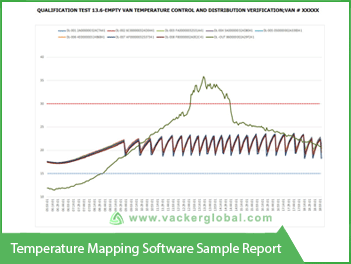 This Temperature Mapping Software is called VacMap Software and is specifically designed for the Cold Chain Industry sectors in regions or areas of Saudi Arabia or KSA such as Dammam, Riyadh, Al Khobar, Jeddah, etc. It is user-friendly and thus the software can be used by the clients, who can perform their own Temperature and Humidity Mapping studies. It is easy to use and can produce reports on the basis of input values provided to it. We understand the fundamentals required to provide the input to the software as we have worked across the globe in connection with temperature mapping, qualification and validation. Furthermore, we embed all constraints of GDP, GMP etc. in the software. Provision of a detailed training on how to install Data Loggers and assistance in deciding the location of those data loggers. These locations vary depending upon the size of the device on which the software is to be installed. Provision of guidelines to write protocols etc. for the assets. Empty test chart for cold rooms, vans etc. can be generated. Full loaded or partial loaded test chart can be generated. Hot and cold points can be identified which can be automatically displayed in the layout drawing. Door opening tests chart for reefers, vans, cold rooms etc., vans, cold rooms etc. 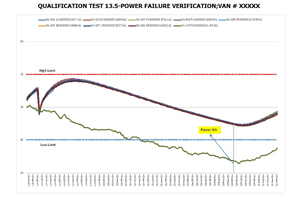 Power failure tests chart and result. The results point out on the duration on how long the temperature will remain unaltered even after a power failure. Start-up tests chart and result that suggest the entire period that is required to reach desired temperature levels. Automatic calculation of Mean Kinetic Value (MKT). Such calculations along with minimum and maximum readings of each data logger can be generated as a report. All other features of Temperature Mapping Validation are covered. Saudi Arabia or KSA being a country with high temperatures and a dry climate, temperature and humidity mapping becomes a must for assets like warehouses, cold rooms etc. Hence temperature and humidity mapping software, supplied by Vacker Saudi Arabia or KSA to regions or areas like Riyadh, Al Khobar, Dammam, Jeddah, etc., needs to be installed in assets that completely depends upon the nature of the material that is being stored along with the quality procedures. Only fundamental parameter like temperature needs to be mapped for assets like reefers and vans since mapping of humidity is not practically feasible because of its uncontrollable nature. 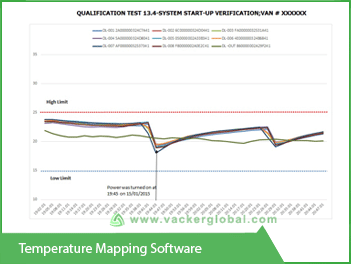 Vacker Saudi Arabia or KSA provides a comprehensive training on the overall modality and functionality of Temperature Mapping Study, Qualification and validation training to regions or areas like Dammam, Riyadh, Al Khobar, Jeddah, etc., which will consist of the same software and its execution part as well. However, the procedure may vary depending upon the nature of asset and the location. Data collection is the primary part of the procedure and we will be providing training on how to export such collected data to the software. Based on client request, the entire training on mapping can be performed on the assets of the client. But it is to be noted that the sampling interval for data collection can vary depending on the asset type. There is no significant difference between thermal mapping study and temperature mapping study. These are just different terminologies used in place of temperature mapping and temperature validation. The temperature mapping study kit provided by Vacker Saudi Arabia or KSA, contains ample number of temperature data loggers and we can supply these kits to customers so that they can carry out the entire study on their own. Similarly, the temperature and humidity mapping study kit consists of temperature and humidity data loggers. Prior to finalization of getting the device, it is suggested that disclosure of asset being used is a must so that the most suitable data logger is supplied to you. And all the data loggers come with 1 year validity on calibration certificate. The mapping study kit comes with an instruction slip for the facilitation of performing the study, sampling interval etc.